There are two primary system considerations centering around an emergency operational situation for control valves. For either fail-safe loss of IAS or loss of electrical power, it is the actuator’s benchset range spring that “drives” the control valve’s plug to its fail-safe open or closed position. Because IAS piping systems can be extensive (big), the IAS can decay too slowly causing operational problems. In such cases it may be desirable to use a 3-way pilot switching valve to “anticipate” the eventual loss of IAS and quickly stroke the control valve to its fail-safe position, eliminating the transitory operational effects of the slow decay. A similar scheme to I.a. previous may be applied for ATCFO arrangements for fail open control valves to eliminate transitory effects. This is accomplished with a “lockup valve”, which is a 2- way pilot switching valve. If the air pressure is lost from the control loop’s airset, the lockup valve will “close” and “trap” the air within the actuator’s loading chamber. A volume tank stores a limited supply of IAS to sustain normal operation for a finite time period, i.e. approximately up to a hour. A high pressure cylinder is on standby with an alternate gas, usually GN2. 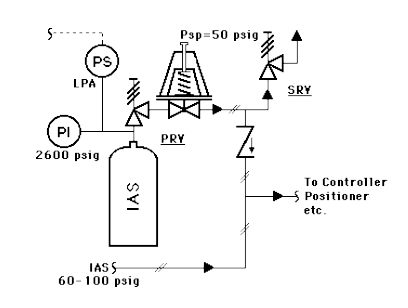 If IAS pressure falls below 50 psig, the alternate gas will take over to supply pneumatic control. The high pressure will allow for several hours of sustained operation, enough time for the emergency loss of the IAS to be restored. Such applications are normally for “very important (critical)” services. Such loops are normally “local” and pneumatic only; i.e. no electrical power involved except the low pressure alarm switch. Protection for loss of electrical power is indirectly accomplished thru the use of a solenoid valve. In normal operation the solenoid valve is energized electrically; in an emergency loss of electrical power the solenoid valve is de-energized and trips to the “shelf-position”. Solenoid voltage can be 120 VAC, 240 VAC, 125 VDC, 24 VDC, etc. 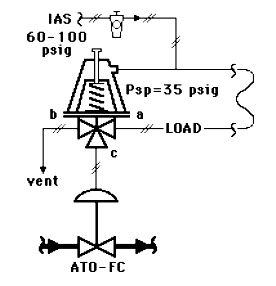 By blocking the LOAD air to the actuator and venting the air within the actuator’s loading chamber to atmosphere (P = 0 psig), the actuator’s benchset range spring “drives” the valve plug “closed”. The solenoid valve is a 3-way type. By blocking the air to the actuator and venting the air within the actuator’s loading chamber to atmosphere (P= 0 psig), the actuator’s benchset range spring “drives” the valve plug open. The solenoid valve and tubing interconnection is identical to the II.a. case previous. This is accomplished with a 2-way solenoid valve. In the “energized” condition, the solenoid valve ports are “open”; loading air passes thru. In the “de-energized” condition, the solenoid valve “closes” and traps the air within the actuator’s loading chamber. What is 3-way Solenoid Valve ? Thank you very much for doing this incredible work!!! this website is highly informative and very useful to instrumentation engineers like me!! !keep doing this great job!!!! 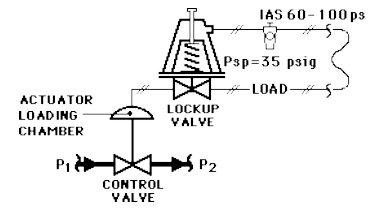 i have a question if i have a control valve, which is actuated by an interlock via a solenoid under trip conditions and if the fail position of the control valve is FLC. In case of loss of air supply or power, the valve will be in Close Position.